Anaplasmosis, formerly known as ‘gall sickness’, in Angora goats is not of great importance as it is usually a subclinical or mild condition that rarely results in a fever, anaemia, icterus or death. It does however have more of an effect on goats than sheep. 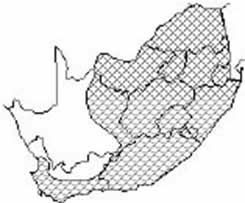 Cases of anaplasmosis would occur in the Karoo if conditions favoured the vectors - arthropods (ticks, mosquitoes, biting flies). In sheep and goats ‘gall sickness’ it is caused by the blood parasite Anaplasma ovis an erythrocytic rickettsial organism. Anaplasma can also affect cattle, sheep, buffalo, and some wild ruminants. How is anaplasma ovis transmitted? Rhipicephalus (Boophilus), the blue tick is the major vector however 17 species of ticks are suspected carriers of the disease. Blood sucking insects such as mosquitoes and biting flies as well as needles are also capable of transmitting the disease. Usually the cases would be subclinical or mild, however clinical signs are more common in goats than sheep. Historically farmers in determining which animals were infected would treat those that lagged behind the flock when herded. Anaemia with signs of fatigue and respiratory effort. 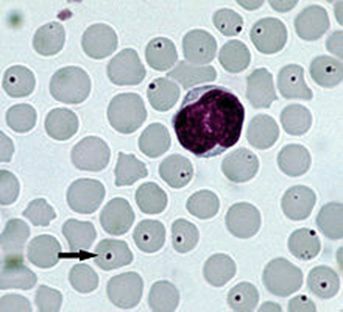 Presence of the parasite on a blood smear but it possible the parasite levels may already have declined when clinical signs are present. Antibody titres can also confirm exposure. The tetracyclines are effective and for practical reasons the Long Acting (LA) formulations are used at 20mg/kg. Treat parasites (internal and external) as these may precipitate the disease.